One of the most exciting research developments in the last few decades has been the multidisciplinary “narrative” turn in social research, involving linguists, psychologists, micro-sociologists, philosophers, anthropologists, political scientists, communications studies, and others. The works in this section reflect my involvement in developing “positioning theory”, which is integral to the narrative turn. Moghaddam, F.M. & Harre, R. (2010). 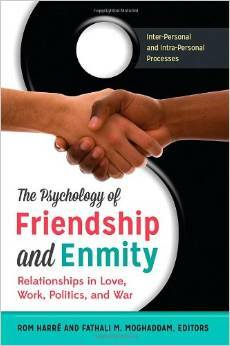 The Psychology of Friendship and Enmity: Relationships in Love, Work, Politics, and War. Westport, CT: Praeger. Moghaddam, F.M. & Harre, R. (2010). Words of conflict, words of war: How the language we use in political processes sparks fighting. Westport, CT: Praeger. Moghaddam, F.M., Harre, R., & Lee, N. (2007). Global conflict resolution through positioning analysis. New York, NY: Springer. Harre, R., & Moghaddam, F.M. (2003). The self and others: Positioning individuals and groups in personal, political, and cultural contexts. Westport, CT: Praeger. Warren, Z., Moghaddam, F.M. (2018). Positioning theory and social justice. The Oxford Handbook of Social Psychology and Social Justice, 319-30. Harre, R., Moghaddam, F.M. (2015). Positioning theory and social representations. The Cambridge Handbook of Social Representations. Sammut, G., Andreouli, E., Gaskell, G., & Valsiner, J. (eds.). Cambridge: Cambridge University Press. Pp. 224-233. Dufour, D.J., Goldberg, R., Moghaddam, F.M. (2013). The enemy of my enemy is my friend. 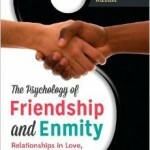 The psychology of friendship and enmity: relationships in love, work, politics, and war. Harre, R., Moghaddam, F.M. (eds.). Santa Barbara: Praeger. Pp. 37-52. Lee, N., Lessem, E., Moghaddam, F.M. (2008). Standing out and blending in: differentiation and conflict. Global conflict resolution through positioning analysis. Harre, R., Lee, N., Moghaddam, F.M. (eds.). New York: Springer. Pp. 113-132. Harre, R., Moghaddam, F.M., Cairnie, T.P., Rothbart, D., & Sabat, S.R. (2009). Recent advances in positioning theory. Theory and Psychology, 19 (1), 5-31. Tan, S., & Moghaddam, F.M. (1995). Reflexive positioning and culture. Journal for the Theory of Social Behavior, 24 (4), 387-400.